The film follows the happy, naive Judy Hopps (Ginnifer Goodwin), who is a rural little bunny with a penchant for being a great police officer. She quickly soon discovers that moving up to becoming a great police detective and officer will be more challenging than she originally thought, since the police department in the metropolis city that is ‘Zootopia‘ is mostly comprised of elephants, buffalo, rhinos, and other large mammals. Judy is so excited to make a difference on her first day, but her police chief Bogo (Edris Elba), a giant buffalo assigns her to parking duty. It doesn’t get her down though, as she writes 200 tickets before lunch on her first day. 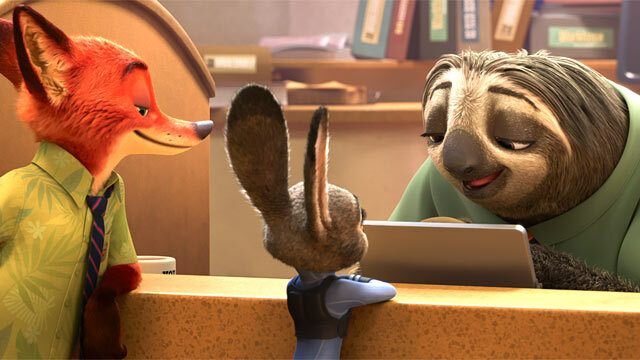 Soon enough, a bunch of Zootopia’s citizens go missing and Bogo gives Judy 48 hours to solve the case or lose her job. 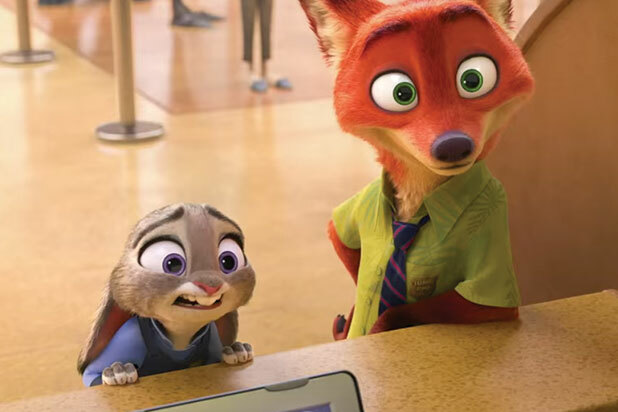 She ends up enlisting the help of a con artist, but good guy fox named Nick Wilde (Jason Bateman) as they go through the seedy underbelly of ‘Zootopia‘ to crack the case and change their own prejudices within themselves. The filmmakers have really outdone themselves here, as they have delivered an excellent story with some smart humor for both kids and adults. There is a ton of amazing satire to go around as well, including having a DMV run by all sloths. I laughed so hard, my face hurt. Goodwin and Bateman are phenomenal as this unlikely duo here, and they completely sell these characters. J.K. Simmons, Tommy Chong, Octavia Spencer and Shakira also lend their voices, and all are excellent. There are some fantastic references to other films that will make you knee slap and gasp for air, and there are also some very endearing moments as well that keeps the movie in check. Nothing ever seems preachy or overly done, which means this screenplay was fantastic. The picture itself boasts tons of color and is great in 3D or without 3D. It looks that good. ‘Zootopia‘ is one of the finer Disney animated films of recent memory, and I’m sure I will enjoy this for many years to come. This entry was posted on Wednesday, March 2nd, 2016 at 9:12 am	and is filed under Film, News. You can follow any responses to this entry through the RSS 2.0 feed. You can skip to the end and leave a response. Pinging is currently not allowed. « Should Leonardo DiCaprio Have Won An Oscar Before ‘The Revenant’?! Uh sir? Where am I to be during all this? No more than two feet away from me. And that's not negotiable.